The result of this partnership is carefully executed in two new timepieces. One, the highly complicated Twin Turbo masterpiece and the other, a limited edition of the Epic X Chrono. The partnership begins with a limited edition of the Jacob & Co. high complication masterpiece. 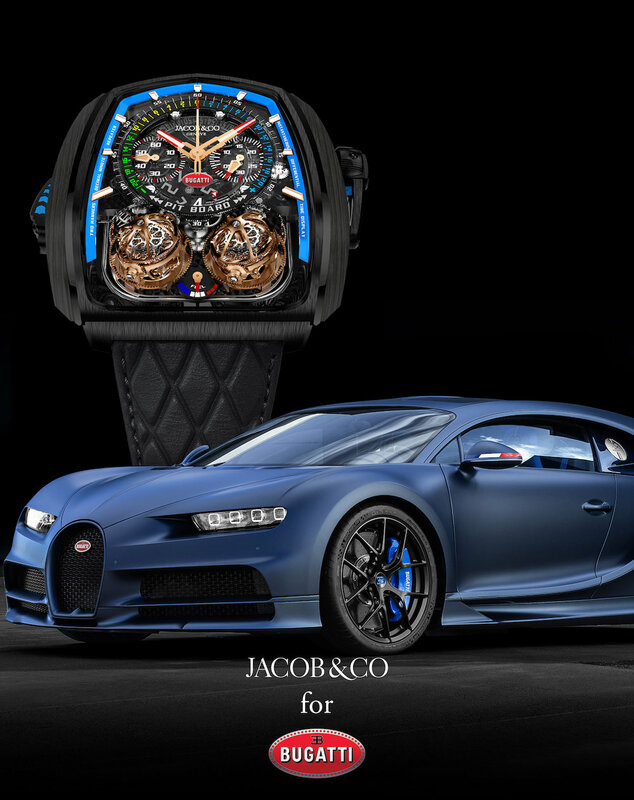 The Twin Turbo Furious Bugatti Edition with its breathtaking twin triple-axis tourbillons, column-wheel chronograph and decimal repeater is the first of the two new watches. Designed with high performance sports cars in mind, the Twin Turbo Furious Bugatti Edition features a turquoise flange around the dial that pays homage to Bugatti’s 110 year anniversary Chiron. The Bugatti logo is proudly and prominently positioned in the center of the dial and renames the power reserve indicator “fuel” adding the colors of the French flag on the gauge-type indicator. Only 39 timepieces will be made, each individually numbered: 18 in carbon fiber, 18 in rose gold, and three with diamond pavé. 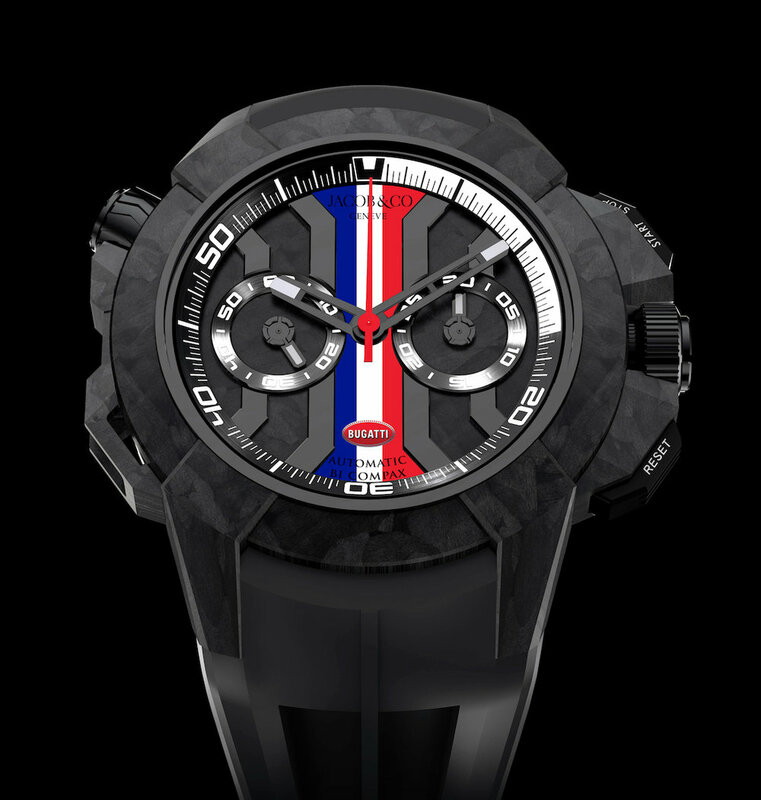 The second watch is the release of a special version of the Epic X Chrono as the ‘Bugatti Chrono Edition Limitée 110 Ans’ in a limited edition of 110 pieces to mark each year since the founding of Bugatti by Ettore Bugatti in 1909. The defining technical element of the Epic X Chrono is the Jacob & Co. JCAA05 skeletonized automatic chronograph movement. This high-end chronograph calibre is equipped with a column-wheel to launch the chronograph functions. Its counters are arranged in a bi-compax format, with the small running seconds on the left, at nine o’clock, and the elapsed minutes counter on the right, at three o’clock; the elapsed seconds are read on the central French flag red chronograph seconds hand. Sticker Price $36,000 USD. 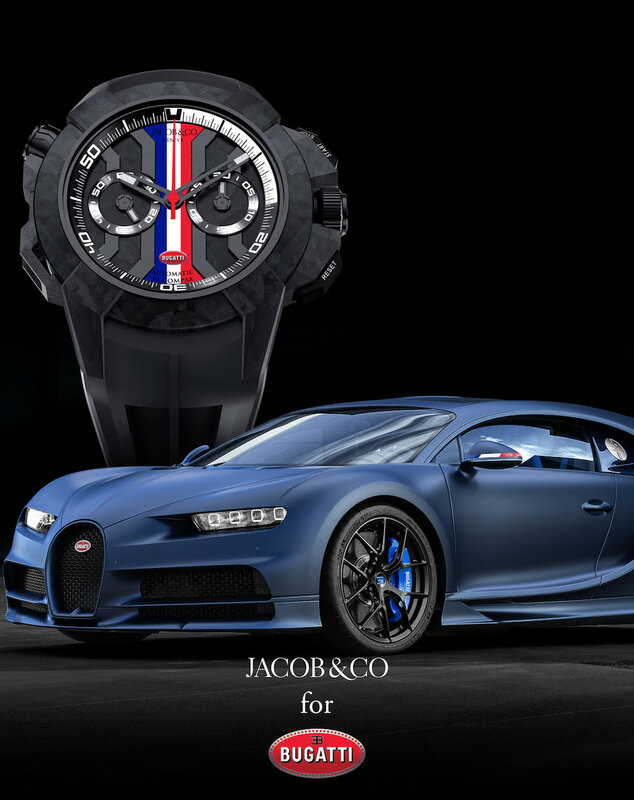 For more info on Jacob & Co. click here.